This post is half confession, half rant, half insight into my spiritually twisted mind. The confession: I'm an ugly town snob. I live in a town that many call "ugly." It's so ugly I recall a friend's wife who cried the first time she saw the place. He had taken a job at ACU and they were moving here. She had never been to ACU. And when she saw the town for the first time, saw her future home, she wept. That's a true story. My town is that ugly. People weep when they see it for the first time. But here's the deal. I love ugly things. I take it as a point of spiritual pride to love ugly things. Which means that I love my ugly town. But the problem with spiritual pride is that it causes you to harshly judge and look down upon others who praise "beautiful" towns and cities. This is the price of being a snob. A close to home example of this. Next week I'll be teaching, for the first time, classes at the Pepperdine lectureship in Malibu, CA. And from what they tell me, Malibu is "beautiful." And what's going to happen next week--watch for it--is that every preacher, teacher and attendee at the Pepperdine lectures is going to Tweet or upload to Facebook photos and updates about going to or being at this "beautiful" place. And in the face of that social media onslaught I'm going to struggle mightily not to judge these people. First off, why do people want to inform everybody back home that they are going to a "beautiful" place like Malibu? Do they have no shame? No social skills? Do they like making people envious? Why would you want to let a person back home know, as he or she slogs through their mid-week work commute, that you are currently sitting at the beach? What sort of sick person Tweets about sitting on the beach while others are working? But beyond this general lack of social skills symptomatic of a catastrophically low self-esteem, I don't think anyone who thinks my town is "ugly" and that Malibu is "beautiful" can be a true Christian. Does not a theology of the cross apply to geography as well? I think it does. No true follower of Jesus could love Malibu over the ugly town. There's a reason Jesus came from Nazareth and hung out in Galilee rather than Jerusalem. Jesus loved ugly towns. Now, I'm aware that all this makes me sound horribly demented. Likely because I am. But to be clear, I am looking forward--really, really looking forward--to the Pepperdine lectures and the people. But I am depressed, spiritually depressed, that I have to go to Malibu. Am I crazy? Perhaps. But I think I'm telling you the truth. I'd rather go to your ugly town than to Malibu. I'd rather get an ice cream cone at your local ugly town Dairy Queen or eat at your ugly town greasy spoon or sit on your ugly town park bench watching the trash blow by. I prefer ugly towns. I find them interesting. And really, aren't oceans, mountains and forests a bit overrated as being spiritual "thin places"? Give me the table in your ugly town where the old timers meet for morning coffee. Or the bridge in your ugly town under which the homeless make their bed at night. Or the place in your ugly town where the poor kids splash in city water on hot summer days. Now those are thin spaces. But few have the eyes to see them. Because any Christian can find God at the ocean. You're on vacation for crying out loud. That feeling you're feeling? It's not the Holy Spirit. It's called "not being at work." I'm really looking forward to the lectures (more on that later this week), but I'm going to be missing my ugly town. 1. Mainly because...um...I don't actually have a Twitter or Facebook account. Serious offer, dude, if you're ever in London and we can work it out, come and have a coffee with me down Peckham high street. It is by turns ugly and beautiful, physically and spiritually, more times in its 2 mile stretch than you could believe. My wife and I are both from small, racially homogenous towns in the heart of England but we feel we could never tire of crazy Peckham. For a taste, google "Peckham peace wall". Ah, Dr. Beck... thou hast madeth me to lie down in fields of mirth. My town is probably what you'd call medium-ugly, and I'm most grateful to you for providing me with yet another thing to be proud about. I'll take you up on that. Checked out the peace wall, very cool. Hi Richard...my first time to comment here. I found you through a search on George MacDonald several weeks ago, and I've really appreciated reading many, many of your posts. Your humor, insight, and humility keep me coming back. Great point. The post is mainly for the sake of humor, with a few small points about seeing God in ugly places. Consequently, the post isn't very helpful in thinking about beauty. Because in truth, I love the ocean and find God when I stand on the shore and listen to the waves and the wind. The key to my comic rant isn't to deny those things, but to question the impulse that we must leave our "ugly towns" to find God elsewhere, mainly in the beautiful place we visit during vacation. I also think the "spirituality of beautiful places" in tempted into being "the spirituality of rich people." I love visiting beautiful places and I am spiritually restored by them, but I am also aware that I have access to this beauty because of my money. So the key, for me, is finding natural beauty wherever you are. The sunrise, the breeze in the tree, the bird sitting strangely close to you, the flower bursting through the urban ruin. No one needs to travel or pay money for these things. And they cultivate a moment by moment awareness of God that you take with you, wherever you go. You must have loved being in Bethany when you recently visited my alma mater, SNU. That is one ugly town. Please come back so I can show the foulest parts. My favorite line: "That feeling you're feeling? It's not the Holy Spirit. It's called "not being at work."" "Because any Christian can find God at the ocean. You're on vacation for crying out loud. That feeling you're feeling? It's not the Holy Spirit. It's called "not being at work."" Haha! Oh man, that's a classic! Let's plan on it. I didn't get to see much of Bethany, but the psychology department took me to breakfast close to SNU at this cool local diner right by the school, done up with 1950s stuff. Lots of regulars in the place. I love places like at. Love them. You've made an interesting point of noting the beauty in the subtle intricacies of "ugliness", however, you've lost me in the diatribe of not sharing your experiences in the "spiritually thin" places of "desirability." You don't have to deprive yourself of enjoyment and the sharing that enjoyment to feel adequate and humbled. In fact, this avenue of deprivation leads me to believe that someone might already be "spiritually thin" when you cannot appreciate the beauty in something without denying the beauty in another. Searching for beauty in something does not qualify you to take away from another. If people revel in the company of one person compared with the other, would you choose to chastise the favorable one to promote the other? Since my ugly hometown is near yours, and since I studied at Pepperdine, and since I now live in a state that people often call ugly...I know exactly what you mean. And I get defensive when people call my hometown ugly, or when they say "I'm sorry" when I mention I'm from there! I find there's something to be said for the beauty of West Texas, and there's something to be said about the ugliness of Malibu or any other beautiful place. The question is, does one have the eyes - aesthetic and spiritual - to see the beauty and ugliness in any particular place? The Pepperdine campus is extra lovely because it's up on a bluff, and you will have an awesome view of the Pacific wherever you are. However, driving along the ocean on the Pacific Coast Highway down below, the view is obscured by all the expensive beachfront houses, most of which are pretty boxy-ugly, for all their $$. If you want a really nice beach and have the opportunity, drive up the coast a few miles to Oxnard (Ventura's "ugly sister") and go to Port Hueneme (pronounced wy-nee-mee) Beach Park at the southern end of town. Nice place for a picnic, fishing pier, good walking beach for the Pacific (not a lot of rocks). San Buenaventura Mission is also nice; not as famous as some of the others, but peaceful, intimate, with a remarkable vestment collection. Have a great time - I know the students will get a lot out of your talks, whatever you plan to say to them. Thanks for this Dana! I am, truly, really looking forward to the visit. I'm right with you! I run a piano studio and one of my main objectives is to bring beauty into as many lives as I can through music and whatever else--art, nature, etc. You're absolutely right that some beauty seems only to be available to the wealthy--yet, I'd bet that those who notice and appreciate it most are those who have very little. That's what my husband said! :-) Truly, not even for one hour! Very interesting to see this posted on the same day as the start of the transpositions symposium on beauty. I do think beauty is over-rated - it seems to have become a dominating category in Christian aesthetics to the exclusion of more varied and complex aesthetic categories. "At Herreid John disappears for a drink while Sylvia and Chris and I find some shade in a park and try to rest. It isn’t restful. A change has taken place and I don’t know quite what it is. The streets of this town are broad, much broader than they need be, and there is a pallor of dust in the air. Empty lots here and there between the buildings have weeds growing in them. The sheet metal equipment sheds and water tower are like those of previous towns but more spread out. Everything is more run-down and mechanical-looking,and sort of randomly located. Gradually I see what it is. Nobody is concerned anymore about tidily conserving space. The land isn’t valuable anymore. We are in a Western town." I am a Western kid born, bred, and raised, and I think there's something to his observation. But maybe it's not specific to West versus East, but more about areas where you care about space versus areas where you don't. SF is a really small city and every square foot is valuable; not so San Jose. "That feeling you're feeling? [...] It's called 'not being at work.'" No, it isn't. When I'm sitting in a library or workspace, doing work, and I look out the window and see the mountains surrounding Vancouver, I feel a sense of the sublime. The same would be true if what I saw was desert, or swamp, or the charred remains of a fire-swept forest, and it is true no matter my activity or mental state. So it has nothing to do with vacation, at least not for me. I'm not saying it's the Holy Spirit, and I'm not saying the mountains are any more numinous than the back alley, but even if they're overrated for you they certainly aren't for me. I readily admit what you say is true for many people. (Further, particular kinds of beauty are economic: the beauty of nice houses and little industry) But for me, the forests, mountains, badlands, etc. are what I need to calm down when I'm worn out from dealing with people. (I seem to recall Jesus doing the same thing; Matthew 17:1-9 comes to mind). Besides, in a city like Vancouver, where you can see the mountains from the back alley, you don't really need to choose. Fair enough. Lots of hyperbole in the post. As to if I'm "better than that" I'm no so sure. I'm a disappointment on lots of different levels. One of my favorite books. I've read it like ten times. I recall it now that you've reminded me! Very apropos. I so totally get this. I was driving through my ugly city this morning, taking a shortcut through a weird industrial area, and thinking about how strange it is that I find these grey desolate places to be cozy and fascinating and wonderful... I actually wanted to stop the car, get out and wander, pick a bouquet of weeds, watch the seagulls eat the garbage, maybe catch a whiff of burning rubber or turpentine... and be as totally unselfconscious as the seagulls and the autobody shops. I went to Vienna last year. Every blade of grass is pretty, not to mention every town. It was cool but it also gave me the creeps. I couldn't find anywhere to hide. You wanna see ugly?!!? Hereford, Texas. Now that's ugly! I love the beauty of Malibu . . . and the beauty that my friends post from wherever they're traveling . 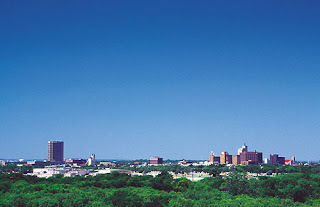 . . and the beauty of Abilene, my home ( http://preachermike.com/2011/01/31/come-ride-with-me ) . . . and the beauty of the cross. "Light of the world, you stepped down into darkness. Opened my eyes, let me see. Beauty that made this heart adore you. Hope of a life spent with you." You know, all that. Pimlico's nice! Someone must have loved it hard in the intervening hundred years. But that's an excellent point about our relationships with the places we live. It's one that's very fashionable in Christianity in the UK at present - "missional community"/"love your city" etc being the buzzwords - but I've never heard it expressed with such wit. As someone who moved FROM San Francisco TO Temple, I totally get this post. I love Temple, Abilene, Malibu, and San Francisco all for different, beautiful reasons. This year, Malibu will be less beautiful because the people I consider most beautiful (my family) won't be there with me. Abilene does have a face that only a mother (or in your case, father) could love. I'm glad I'm not the only one who feels that way. Au contraire! When filtered through the lens of blue-collar Mexican food offerings, Abilene plays second fiddle to NO ONE. As someone who made/ makes big life decisions on the beauty of the surrounding community (no ocean or no mountains + inability to get good cup of coffee = lots and lots of tears), I sheepishly comment: I think there's something about extremes of beauty or ugliness that are both spiritually thin places because they seem enhanced or more authentic. and it seems perfectly normal that you'd miss your community in place that seems like the polar opposite. I actually liked Abilene in the early 70's when I visited there. I've been to Malibu too. I'll take Abilene, thank you. I often feel the same way about places, but not because of their location in mountains or forests or whatever, but because of their pseudo-randomness vs planned-ness (I'm sure there are better words for that). I love towns and cities that have grown up haphazardly, that don't have straight roads or sensible designs. To be fair, I don't often like driving through them, but I love walking through them. I get a sense of the unexpected about to happen. Whereas when I walk through the glistening cathedrals city planners have built for the god of Doing It Right, I feel a certain oppressive expectation, as if I'm being forced to kneel... and I don't want to.